What Else Can I Expect from an Online Bachelor's in Ministry Program? Ministry is a vocation that trains leaders in the Christian faith. According to church doctrine, a minister is ordained to teach Christian principles and, in many cases, presides over sacramental ceremonies such as marriages or baptisms. Specific titles vary by denomination. Catholic ministers carry the priest designation, while Protestant ministers may be known as pastors, presbyters, elders, chaplains, or bishops. Most ministerial careers require a bachelor's degree as a standard educational qualification. Undergraduate ministry programs emphasize biblical study, theology, community involvement, and religious leadership. Religious colleges across the country offer ministerial programs, but many students choose to earn their bachelor's in ministry online. Web-based programs generally follow the same curricula as brick-and-mortar programs, and distance learners may find that the asynchronous format of most online programs proves ideal for students with part-time jobs, childcare duties, or other commitments that can interfere with campus-based learning. Read on to learn more about ministerial programs and what you can do with an online bachelor's degree in the field. WILL AN ONLINE MINISTRY DEGREE PROGRAM PROVIDE ME WITH THE SKILLS I NEED TO ADVANCE MY CAREER? An online bachelor's in ministry program will introduce students to the fundamentals of biblical study and religious leadership. Programs also emphasize community outreach and project management, along with financial accounting, marketing, human resources, and other relevant business-related dimensions of study. Many online ministry programs culminate with a capstone course, which allows students to demonstrate the skills and knowledge they have learned with a comprehensive research project. WILL AN ONLINE MINISTRY DEGREE PROGRAM WORK WITH MY SCHEDULE? Online bachelor's in ministry programs offer a flexible alternative to traditional classroom-based education. Students receive access to course lectures and readings, participate in class discussions with fellow students, submit written assignments, take exams, and communicate with their professors on their own schedules. Current technology also enables learners to study on the go using a laptop, tablet, smartphone, or any other Wi-Fi-compatible device. The best online bachelor's in ministry programs also help students coordinate projects, fundraisers, and events in their local community. WHAT JOBS CAN I GET WITH MY BACHELOR'S DEGREE IN MINISTRY? Students who earn bachelor's degrees in ministry typically pursue careers in church leadership. Alternatively, graduates may also seek supportive positions in churches and other religious establishments; these include roles in youth leadership, religious education, and music. Outside of the church, many bachelor's recipients may follow an entrepreneurial path by launching a religious business or nonprofit organization. WHAT ARE THE BEST ONLINE MINISTRY DEGREE PROGRAMS? Choosing a program remains a very personal decision, and only you can properly evaluate whether a target school's strengths match your educational needs. 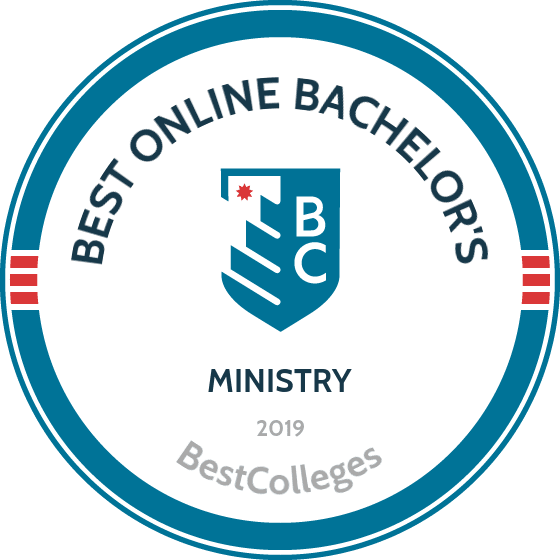 The following ranked list of schools should serve as a helpful starting point in your search for the best online ministry programs in the United States. If you feel the call to become a religious leader, and you want to prepare for your career with an online degree, read on to learn more about the top online ministry programs in the country. Founded in 1932, CSU operates out of a main campus in northeast Pennsylvania. CSU holds accreditation from the Association for Biblical Higher Education and the Middle States Commission on Higher Education. This Baptist institution offers undergraduate, graduate, and seminary programs to almost 1,000 learners, including an online bachelor’s in Christian ministries. CSU’s online bachelor of science in Christian ministries introduces ministry principles, practices, and skills directly relevant to working in the church. The curriculum prepares graduates to know and serve God by developing an understanding of Scripture, analytical skills for assessing theological concepts, and communication techniques for spreading the Gospel. The program can lead to opportunities for graduate study in divinity, careers in ministry, and personal service to churches and communities. Students pursuing this online ministry degree complete a total of 121 credits, including 36 credits in Bible and theology, 18 elective credits, and 33 credits of ministry leadership coursework. Core course topics include Bible study, building a biblical lifestyle, and theological distinctives. Additional coursework is also required in academic writing, living well, general psychology, and world religions. Ministry leadership classes emphasize dynamics of discipleship, family and personal life of ministry leaders, and effective Bible teaching. Students generally complete this online ministry degree in four years. Flat-rate tuition for online learners and tuition discount options create an affordable option for students of all ages. Participants can transfer up to 90 applicable credits into this program. Established in 1978, Regent University — located in Virginia Beach, Virginia — trains working professionals to integrate faith into their current roles. Regent offers undergraduate, graduate, and professional programs to more than 10,000 learners. Regent’s 18-to-1 student-to-faculty ratio also provides learners with a high level of attention from instructors. Accredited by the Southern Association of Colleges and Schools, Regent offers an online bachelor of science in professional studies - biblical and theological studies. This transfer-friendly program is especially well-suited for adult learners and military personnel. Students complete 49 general education credits, 24 professional studies credits, 21 major-related credits, and 26 credits of electives. Online classes last eight weeks. Graduates learn to teach the Bible in a church or ministry setting, lead mission and ministry teams and members, and confidently defend their faith. Regent’s online bachelor’s in biblical and theological studies prepares graduates for careers in church pastoring and ministry, missions and evangelism, nonprofit administration, and teaching. Learners also develop their understanding of biblical history and Christ’s message, which prepares them for further study in a graduate school or seminary. Admission requirements vary depending on a student's age and experience. Online learners pay by the credit, with full-time students pay slightly less than part-time learners. Students must earn a "C-" or higher in major-related courses and complete at least 50% of their major requirements at Regent. From its 7,000-acre campus in Lynchburg, Virginia, Liberty offers programs in over 600 fields of study to more than 100,000 online and on-campus students. Founded in 1971, the school incorporates Christian teachings into its undergraduate, graduate, and specialist degrees. Students can complete the school's 120-credit online bachelor of science in religion - biblical and theological studies in 3.5 years. The curriculum explores the history of Christianity, scriptural teaching, and foundations of biblical principles as they apply to the ministry. Graduates prepare for biblical and servant leadership in the Church and their communities. They can also pursue careers in communication, education, social services, and the clergy or continue on to graduate study. Learners complete 36 credits in the major, covering apologetics, methodical scriptural study, research and writing for religious discourse, and practical teaching of Scripture. Students also explore Christian life and thought through 12 credits in Old and New Testament surveys, evangelism, and contemporary moral issues. Coursework for this online bachelor’s in religion concludes with a ministry or research capstone requirement. Learners can transfer up to 90 credits of previous coursework into the program. Military service members, veterans, and military spouses may qualify for admission fee waivers. Liberty holds membership with the Association of Christian Schools International and the Council of Independent Colleges in Virginia. The school maintains regional accreditation through the Southern Association of Colleges and Schools. Founded in 1943, BCF currently offers undergraduate and graduate programs in theology, music, counseling, social science, humanities, education, and business. A cooperating ministry of the Florida Baptist State Convention, BCF also maintains accreditation through the Southern Association of Colleges and Schools. It is also licensed by the State of Florida Department of Education’s Commission for Independent Education. Online offerings at BCF include bachelor of arts tracks in biblical studies, Christian studies, ministry, leadership and Christian education, and ministry studies. Each online bachelor’s degree is comprised of 120 credits. Major coursework for the biblical studies degree emphasizes biblical hermeneutics, principles of teaching, introduction to the Christian worldview, and biblical studies integration. The Christian studies curriculum is a degree completion track designed for students with an associate degree; it includes 42 major-related credits in personal evangelism, the Bible, and practical ministry coursework. Ministry and ministry studies curricula prepare graduates for careers in the ministry with classes that emphasize church leadership, discipleship and missions, Christian doctrine, and contemporary ethical issues. The ministry studies program offers more flexibility than the online ministry degree, with options for students to tailor their degree toward specific ministry roles. BCF’s leadership and Christian education program trains degree seekers to work as pastors, ministers, and ministry leaders. Participants engage in coursework that emphasizes practical, theological, and biblical leadership theory. Students complete 39 credits in biblical and theological classes, alongside a 27-credit concentration in Christian education staff, student ministry, or church administration. BCF educates about 625 students and boasts a 14-to-1 student-to-faculty ratio. Applicants must submit a church/pastor recommendation and personal references. Located in Fayetteville, North Carolina, Grace College of Divinity offers programs designed to complement discipleship and ministerial activities within local churches. GCD’s degrees build competencies in Christian leadership, worship, ministry, and family life. The school's 120-credit online bachelor of arts in divinity can be completed in four years. Students focus on three disciplines across the curriculum: biblical studies, theology, and practical ministry. Degree seekers learn to apply the Gospel to their lives and work within the church. Coursework develops communication skills; an understanding of the role the church plays in historical, philosophical, and contemporary issues; and practical knowledge of the ministry experience. Learners complete 33 credits of biblical and theological studies classes in the New and Old Testaments, systematic theology, pastoral epistles, and hermeneutics. General studies classes in topics like writing, counseling, and church history accompany 12 credits of leadership coursework. Students explore leadership habits and attitudes, spiritual formation, and facilitating leadership in others. Additionally, ministry electives in church life, church growth, life coaching, and cross cultural ministries prepare graduates for careers in practical ministry settings. Online bachelor’s in divinity students end their program by completing a senior seminar and capstone course. During the capstone class, students complete research, writing, or project exercises approved by a faculty member. An optional leadership practicum sequence allows students to lead and serve with ministry professionals; participants work closely with a mentor to develop character and an understanding of the ministry setting. GCD maintains accreditation through the Association for Biblical Higher Education and the Association of Christian Schools International. Established through the merger of three Bible schools in Texas and Oklahoma in 1943, SAGU is located in Waxahachie, Texas, and serves several districts of the Assemblies of God Church. The school received accreditation from the American Association of Bible Colleges in 1948 and gained regional accreditation from the Southern Association of Colleges and Schools in 1989. SAGU’s online bachelor's degree in Bible and theology includes 57 credits of general education coursework, 24 credits of electives, and 39 credits related to the major. Students complete general biblical studies classes as part of their general education requirements, exploring topics such as New and Old Testament literature, Christian ethics, and pentecostal doctrine and history. Major classes in hermeneutics, Christianity through history, and systematic theology build knowledge of theological doctrine and biblical development. Students also develop analytical and critical-thinking skills to better understand and interpret the Bible, identify and assess Christian worldviews, and examine theological writings and arguments. The 120-credit online bachelor's degree in Bible and theology at SAGU prepares graduates for careers in the ministry and in general Christian service. Learners can go on to work as ministry leaders, program directors, social workers, youth coordinators, and spiritual care counselors. To apply, prospective students must demonstrate a Christian lifestyle and submit a Christian character reference. Online learners pay a flat-rate tuition and gain access to SAGU’s extensive financial aid opportunities. A private Christian college in St. Bonifacius, Minnesota, Crown traces its origins to 1916. The school boasts a 14-to-1 student-to-faculty ratio, providing its 1,300 students with high levels of attention from instructors. Affiliated with the Christian and Missionary Alliance, Crown also maintains membership with the Council of Christian Colleges and Universities. The school is also regionally accredited by the Higher Learning Commission. Crown offers more than 40 undergraduate majors, including an online bachelor of science in biblical studies. This program builds students' understanding of the Bible and facilitates their personal and professional spiritual growth through in-depth study of Scripture. Students also develop their life mission, learn to interpret and apply biblical principles, and deepen their leadership skills to guide others. The flexibility of this 125-credit program gives students the opportunity to double major in biblical studies and Christian ministry. Participants can also follow an accelerated degree track, earning a master’s in Christian studies or master of divinity in one additional year after graduating with their bachelor's. The curriculum includes 45 credits of major-related coursework, covering topics such as interpreting Gospels, contextual and missional engagement, and theology of evangelism and missions. Students also complete 49 credits of electives, 31 general education core credits, and 18 credits in the history of the Old and New Testaments, systematic theology, and apologetics and Christian evidence. Crown accepts up to 95 transfer credits into its bachelor's programs. Affiliated with the Church of the Nazarene, NNU offers undergraduate, graduate, and continuing education programs online and from its campus in Nampa, Idaho. NNU hosts over 60 areas of study and maintains accreditation through the Northwest Commission on Colleges and Universities. It also holds membership with the Association of Christian Schools International and the Council for Christian Colleges and Universities. Students can complete NNU’s online bachelor of arts in Christian ministry in as few as 36 months. The program includes five-, seven-, and eight-week asynchronous courses that fit into the schedules of working professionals and adult learners. The curriculum is designed to prepare individuals to serve in the ministry and deepen one's spirituality. Current pastors can also enroll to sharpen their hermeneutical skills. This 124-credit online ministry degree includes 52 major-related credits, 55 general education and foundational credits, and 18 elective credits. Major coursework includes biblical interpretation, history of the Christian tradition, preaching, pastoral theology, and worship theory and development. Learners can complete electives in family ministry; children’s, youth, and compassionate ministries; instructional Bible study; and communicating the Gospel. The online ministry curriculum also includes a senior capstone, in which students integrate theology and ministry into case studies to demonstrate their knowledge. Transfer students must hold a cumulative GPA of 2.0 or higher in previous college coursework, although applicants with a GPA below 2.0 may receive provisional acceptance. Learners can transfer up to 62 credits into the program. Originally founded in 1944 as a Bible institute to train teachers, preachers, and Christian workers, LCU now offers undergraduate and graduate programs to Christians in all vocations. Students attending class online or on LCU’s 130-acre campus in in Lincoln, Illinois, enjoy small class sizes with a 14-to-1 student-to-faculty ratio. Students pursuing the school's online bachelor of arts in Christian ministry prepare for careers in the ministry while engaging in personal and professional spiritual growth and learning to embrace a biblical worldview. Coursework also prepares learners to preach in a church setting, teach young Christians, and apply biblical principles to their daily lives. Core classes in LCU’s online bachelor’s in Christian ministry program include Christian leadership, church administration, pastoral care, and global cultural intelligence. Additional courses in evangelism, discipleship, and faith development explore personal Christian growth, while a foundations of Christian ministry course offers a historical survey of the ministry to build one's understanding of the contemporary Church. Students can choose between a course in homiletics or teaching ministry of the church. The former emphasizes the theological basis for preaching, while the latter focuses on theological, psychological, sociological, and practical aspects of educational ministries. Learners also complete a class in Christian spirituality that analyzes authentic relationships with God or a course in biblical theology of worship. Applicants must submit an essay, Christian character reference, and standardized test scores. LCU holds accreditation from the Higher Learning Commission and the Association of Biblical Higher Education. With a main campus in Lancaster, Pennsylvania, LBC offers undergraduate, graduate, and seminary programs from five locations across the United States. Through eight academic departments, LBC's 2,000 students pursue 27 fields of study and benefit from an intimate 15-to-1 student-to-faculty ratio. LBC holds accreditation from the Middle States Commission on Higher Education and the Association for Biblical Higher Education. LBC’s online bachelor of arts in biblical studies program offers two degree tracks. An accelerated, two-year track features a flexible curriculum and targets students who already hold an associate or bachelor’s degree. Alternatively, the four-year program is a traditional bachelor's track that includes general education classes alongside interdisciplinary and Bible coursework. Both programs include core classes in Christian service, biblical hermeneutics, the New and Old Testaments in cultural context, and the life of Christ. Electives in biblical exegesis, biblical archeology, and church history allow students to broaden their understanding of theology, the Bible, and its role in the lives of past and contemporary Christians. Learners can gain practical experience through internships and practicums with local churches, nonprofit organizations, and youth centers. Applicants to the accelerated program must hold an associate or bachelor’s degree earned with a minimum 2.0 GPA. All applicants must confirm their dedication to Jesus Christ and commitment to living a Christian life based on God’s Word. Currently located in Southlake, Texas, TKU is affiliated with the Gateway Church and offers undergraduate, graduate, and seminary degrees to students on campus and online. TKU holds accreditation from the Transnational Association of Christian Colleges and Schools and the Association for Biblical Higher Education. TKU’s online bachelor of Christian ministries program includes 124 credits of general education, Christian foundations, elective, major, and experiential learning classes. Christian foundations courses include the spirit-formed life, Pentecostal charismatic movements, introduction to the Bible, the Christian worldview, and the life of Jesus. Students also complete 54 major-related credits, taking courses such as Old and New Testament studies, Christian doctrine, pastoral ministry, sermon preparation, and ministry and administrative skills. The degree culminates with a senior capstone project, senior internship, and experiential learning practicum in junior ministry. Additional elective courses emphasize biblical studies and practical ministry. Online courses last seven weeks. Students pursuing this online bachelor of Christian ministries train to respond and adapt to contemporary challenges using a faith-based perspective and approach. Graduates prepare to lead others in spiritual growth, provide organizational support in a ministry setting, and communicate spiritual messages in a variety of formats. Online learners can transfer up to 90 credits into the bachelor of Christian ministries program. Distance and on-campus students pay the same tuition rates. Founded in 1907, Toccoa Falls College — in northern Georgia — holds accreditation from the Accrediting Association of Bible Colleges and the Southern Association of Colleges and Schools. The college offers 34 undergraduate majors through four academic schools. Its online programming includes bachelor of science degrees in ministry leadership and youth ministries. The online bachelor’s in ministry leadership contains 126 credits and consists of general studies, Bible and theology, and ministry and leadership courses. Thirty credits of major-related coursework cover leadership and management theory, ministry leadership and society, leadership formation, and strategies for leadership development. Most students also complete a ministry leadership internship, although participants with previous ministry experience may substitute a communication course instead. Toccoa Falls College’s online bachelor’s in youth ministries program emphasizes Bible and theology coursework. Learners take 30 credits of specialized youth ministry coursework, enrolling in classes like foundations of youth ministry, emotionally healthy youth ministry, spiritual care and counseling for youth ministry, and youth evangelism and disciple-making. An internship allows students to apply classroom learning in practical youth ministry settings. Transfer applicants must submit an application, personal testimony, and transcript information describing previous college-level coursework. Applicants entering one of the college's online bachelor’s programs straight out of high school must submit an application, personal testimony, high school transcripts, and standardized test scores. CBU offers bachelor's, master's, and doctoral programs in more than 40 majors through three California campuses and online. The school's online bachelor's in Christian ministry and leadership is available both online and in a hybrid format.The online ministry degree at CBU focuses on building a foundation in servant leadership for a career in Christian ministry. The BA in Christian ministries requires the completion of 48 major-related credits. Topics include Jesus and the gospels, introduction to philosophy, Christian theology, biblical interpretation, and pastoral leadership. Additionally, students must complete prerequisites in general and intermediate composition and meet general education requirements for undergraduate programs at CBU. Preferred applicants possess at least 24 transferable college-level credits earned with a minimum GPA of 2.0. Students who do not meet this credit requirement may submit their high school diploma for admissions consideration. Accepted students are matched with a personal academic adviser to complete the registration, financial aid, and degree-planning process; they remain assigned to their adviser throughout their studies at CBU. CBU charges the same per-credit tuition rate for online undergraduate coursework, regardless of a student's state of residence. Distance learners complete courses online through the Blackboard learning management system. Most students complete the major-related coursework for their online BA in Christian ministries in 16 months. CBU offers support to online students through virtual tutoring options and exclusive career networking opportunities. Established in 1968 in Watertown, Wisconsin, Maranatha operates as one of the state's most comprehensive evangelical schools. The university began offering distance programs through Maranatha Online in 2009, and distance learners can now choose from 14 associate, bachelor's, and master's degrees and certificates. The school also supports online dual-enrollment high school and tuition-free military learning programs. Maranatha's online bachelor of science in Bible comprises 128 credits. The school offers a bachelor's-to-master's pathway curriculum, ideal for students seeking an accelerated degree track that ultimately leads to a seminary degree. Courses explore many topics, including Corinthians; Baptist heritage; and Christian life, leadership, and evangelism. Students complete classes that last eight, 12, or 16 weeks. Students may transfer up to 98 credits from another accredited institution toward their online bachelor of science in Bible at Maranatha. Maranatha charges the same per-credit tuition rate for online undergraduate coursework, regardless of a student's state of residence.Students usually complete courses asynchronously, although some classes may require occasional synchronous sessions. Advisers recommend that students take only one course during their first semester to get acquainted with virtual learning. Students can then enroll in up to 18 credits per term. Maranatha offers support to distance learners through online tutorials and course orientation, tech support, and test-proctoring services. Students can also search the library database and order books online. Founded in 1935 as the Alabama Shield of Faith Institute, SEU continues to emphasize student-centered programs in the Pentecostal Christian tradition. Originally opened in Brockton, Alabama, SEU moved to its current location in Lakeland, Florida, in 1946. The university offers both traditional and online learning options. SEU oversees more than 20 online programs across seven major academic areas, including ministry, divinity, and theological studies. The school's online bachelor of science in ministerial leadership offers two concentration options: children's ministry and youth ministry. The program comprises 122 credits that combine a general education core, biblical and theological studies, ministerial leadership studies, and general elective courses. Both online concentrations emphasize coursework in pastoral family care, creative communication in ministry, and the evangelism and discipling of children. The program requires students to complete general education requirements in the humanities and fine arts, business, and natural science. Students may choose college-level courses from any department at SEU to fulfill elective requirements. Graduates of the bachelor of science in ministerial leadership program at SEU meet credentialing requirements for ministers under the Assemblies of God. Distance learners complete eight-week courses online as part of a cohort group. SEU charges a set tuition rate — per credit — for online undergraduate coursework, regardless of a student's state of residence. Applicants must submit SAT or ACT test scores and a personal reference. Founded in 1901, Trevecca occupies a main campus in Nashville, Tennessee, along with two extended campuses in Atlanta, Georgia. As one of only eight Nazarene-affiliated schools in the nation — and the official higher learning institution of the southeastern region of the Church of the Nazarene — Trevecca offers more than 130 academic programs that integrate faith and learning; students can complete many of these programs online. The curriculum in Trevecca's online bachelor of arts in Christian ministry comprises four primary components: holistic mindset, missional vision, servant leadership skills, and ministry competence. Students must complete core courses in topics like Christian ethics, theology of the Church, and shepherding the congregation. Learners also underate a Christian ministry capstone. This program operates as a degree completion track. As such, applicants must hold at least 40 college-level credits, earned at an accredited institution with a minimum GPA of 2.0. Ideal candidates possess some proficiency in using computer technology and have a familiarity with virtual environments. Many students complete the online core components for this BA in just 18 months. All distance learners pay the same per-credit tuition rate, regardless of their state of residence. Participants complete courses online through Blackboard, moving through the entire degree track as part of a student cohort group. Trevecca awards college credits for military training and may waive tuition for qualifying military students, veterans, and their families through the Yellow Ribbon Program. Founded in 1995, ASOT was founded on the grounds of the historic First Baptist Church in Apex, North Carolina. The school eventually moved to a larger campus in Durham and also expanded to include online programs. Today, ASOT offers six associate, bachelor's, master's, and doctoral degrees on campus or online. Additionally, the school maintains an articulation agreement with the Seminary Extension of the Southern Baptist Convention. ASOT's bachelor of theology comprises 128 credits. Students complete mandatory general education coursework in topics like English composition, African American history, and introduction to sociology. In addition, learners complete four courses each in the Old Testament, the New Testament, theology, and the practice of ministry. The degree track features career-focused coursework in pastoral and Christian education, ethics and church administration, and field experience/mission requirements. Applicants must subscribe to ASOT's Statement of Faith and provide a spiritual autobiography to demonstrate a strong Christian character and scholastic aptitude. ASOT charges distance learners the same per-credit tuition rate as on-campus students, but adds an additional technology fee per credit for online learning. ASOT maintains an open enrollment policy. Distance students can access many online learning support resources, including a writing center, bookstore, disability services, and financial aid. Online students may also attend commencement services with their peers on campus. Andrews ranks as one of the nation's best schools that holds affiliation with the Seventh-day Adventist Church. The university operates a main campus in Berrien Springs, Michigan, and serves an enrollment of more than 3,300 students. The school offers about 200 undergraduate and graduate programs, including more than 30 online programs and certificates through its school of distance education and international partnerships. The bachelor of arts in religion at Andrews prepares students to enter the Adventist ministry, pursue seminary studies, or obtain a graduate degree in ministry. The 124-credit program encompasses major and elective courses, along with the school's core experience module, which includes a service-learning component of 40 volunteer hours. This online ministry degree concludes with a seminar in contemporary theology. Applicants must possess a high school diploma earned with a minimum 2.5 GPA or a GED with a minimum score of 450 on five sections. Additionally, students who completed high school within the last three years must submit ACT or SAT scores. Transfer students should hold a minimum 2.5 GPA in prior college-level coursework. Andrews charges a set, per-credit tuition rate for online learning, plus an additional distance learning fee each semester. Distance learners complete courses online using the D2L learning management system and through the LearningHub platform. Students can access a variety of support resources, including virtual tutoring and advising, a help desk for technical support, and library services. Andrews also live-streams sermons from the Pioneer Memorial Church on Saturday evenings. The program offers year-round admissions and self-paced online courses. With an enrollment of more than 4,000 students, ORU occupies 263 acres in Tulsa, Oklahoma — the second-largest city in the state. The university offers nearly 100 academic programs for undergraduate and graduate students, with ministry and leadership ranking among the most popular majors. ORU features dozens of online degrees and certificates, all providing the same quality education as the university's traditional programs on campus. The bachelor of arts in ministry and leadership at ORU emphasizes discipleship and spiritual leadership skills for careers in Christian ministry. Students choose to follow one of five concentrations: church administration, evangelism and outreach, local church pastor, sports ministry, or youth and family ministry. Regardless of their concentration, all participants complete a core cognate covering the Old and New Testaments, hermeneutics, intro to theology, and world religions or Christian apologetics. Distance learners may opt to complete a practicum in their area of concentration. Students also complete general education classes, including English, health and physical education, and social science. The program encompasses eight consecutive semesters of required courses, although online students may study throughout the year to graduate faster. Distance learners may start the program at one of multiple start dates throughout the year. ORU awards a variety of need- and merit-based scholarships to qualifying students enrolled in distance programs. The university also maintains its own radio station and mobile app, delivering faith-based content to subscribers and students all over the United States. Founded in 1867 in Bristol, Tennessee — and affiliated with the Presbyterian Church — King University occupies 135 acres and boasts many historic Georgian-style buildings on campus. King offers 90 majors, minors, and concentration areas, including more than 15 programs that students can complete online. U.S. News & World Report recently ranked King among the best value schools in the South. The online BS in religious studies at King emphasizes broad communication and professional skills in the context of a career in Christian ministry, pastoral education or service, or social work. This degree-completion program requires at least 45 transferable credits, which students apply toward the 124 credits needed to earn an online ministry degree. Once accepted into the program, students complete 12 major-related courses. Students can being taking classes at one of several start dates throughout the year. Applicants should hold a minimum 2.2 GPA on previous college-level coursework, although students with lower GPAs may still apply for conditional admission. The program accepts up to 76 transfer credits. Most students complete the major core requirements of this program in 16 months. Distance learners take courses through the Canvas learning management system. New students can participate in an online orientation experience. Online learners gain access to several supplemental resources, including virtual tutoring options, disability services, tech support, and library and bookstore access. King charges online learners a flat, per-credit tuition rate and offers additional rate reductions to military students and veterans. Founded in 1890 by a Methodist reverend, Asbury maintains a campus in Wilmore, Kentucky. The school serves nearly 4,000 students in over 50 major areas of study, offering comprehensive multi-level liberal arts programs rooted in the Wesleyan-Holiness tradition. Asbury hosts an online bachelor of science in ministry management through a longstanding partnership with the Salvation Army. Open to graduates of the Salvation Army's officer training program, this degree-completion program combines online courses with mandatory bi-annual campus intensives. Students may transfer up to 75 credits toward this online ministry degree, completing a total of 124 credits in order to graduate. Coursework emphasizes business, leadership, and management skills in the context of the Christian faith. Applicants must submit a recommendation and letter of reference from the Salvation Army Eastern Territory‘s College for Officer Training to qualify for admission into this program. Prospective transfer students must also submit any prior college transcripts for credit evaluation. Designed to boost the skills learned during the Salvation Army's associate track, this bachelor's program delivers coursework to students over a five-year period. Distance learners complete classes as part of a cohort group. Courses may use both asynchronous and synchronous learning methods. Asbury broadcasts live chapel services three times a week through its radio station and features archived podcasts online for distance students. Founded in 1908, Biola set out to maintain traditional faith-based programs. The university's school of theology — established in the 1940s — currently includes the Institute for Spiritual Formation and dozens of programs in theology, religious studies, and Christian apologetics. Biola has a main campus in La Miranda, California, and educates many students online. It serves an enrollment of over 6,000 individuals through more than 150 academic programs. The online bachelor of science in biblical ministries at Biola features a broad curriculum, preparing graduates for Christian ministry work related to education, youth and children's ministry, and women's ministry. Course topics explore counseling, church administration, contemporary religion, and basic ministry skills. This online ministry degree requires students to complete 120 credits in core, major, and elective courses. Students may choose to add a minor in biblical and theological studies, which consists of 30 credits in theology and Scripture. Prospective students can try out an online course in foundations of ministry for free prior to enrolling in the program. Applicants should have completed at least 15 college-level credits with a minimum GPA of 2.5 and provide a statement of Christian faith. Students with fewer than 15 credits must also submit SAT or ACT scores. Transfer students can apply as many as 70 eligible credits toward their BS degrees. Biola gives preference to students with at least three years of work experience. Distance learners can start the online bachelor's in biblical ministries program in August, December, or April. Learners complete courses through the Canvas learning management system, participating in both synchronous and asynchronous study. Participants choose whether to study full time or part time, taking 3-6 online courses each semester. Located in the twin cities of Minneapolis and St. Paul, Minnesota, UNW offers Christ-centered liberal arts programming. The university serves an enrollment of nearly 3,500 undergraduate and graduate students, featuring more than 75 academic majors, minors, and early college programs. UNW also operates a Sioux Falls location and offers dozens of online programs through its college of graduate, online, and adult learning. UNW's online ministry degree emphasizes a critical understanding of the Bible, exegetical methods, history of the Christian church, and biblical customs. Students must complete 125 credits. The curriculum for this BA in biblical and theological studies requires learners to complete core courses in theory and contexts of a biblical worldview, as well as seminars in theological and exegetical methods. Applicants must submit SAT or ACT scores. Transfer students should submit college transcripts but they do not typically need to submit standardized test scores. UNW uses an August admissions deadline, accepting online students for the following fall term. Distance learners pay a set rate for tuition based on a standard 12-credit course load per semester. Online students complete courses through the Moodle learning management system. Individuals enrolled in online programs can access several virtual resources, such as tutoring, disability services, tech support, and academic counseling. Founded in 1968 in central Ohio, MVNU serves an enrollment of more than 2,200 students through academic programs rooted in the Christian tradition. The university offers associate, bachelor's, master's, and doctoral programs across seven academic schools and colleges. MVNU also features more than a dozen online programs that emphasize professional business, education, and ministry leadership skills. The online ministry degree at MVNU features 40 major-related credits in topics like teaching the Bible, evangelism and discipleship, and current ministry issues. This degree-completion program is well-suited for aspiring ministers, church administrators, and community church advocates seeking career preparation skills. Students must also complete an applied leadership project to earn their BA in ministry leadership at MVNU. Applicants must submit transcripts for all prior college coursework, earned with a minimum GPA of 2.0. Students should possess at least 56 transferable college credits, and they must have earned a "C" or higher in a course to receive transfer credit. Applicants who do not meet these criteria can satisfy general education requirements at MVNU before applying to the ministry leadership program. Distance learners complete courses online through the Moodle learning management system. MVNU charges resident students less than out-of-state learners. Most participants take 12-18 credits per semester. Students taking more than 18 credits in a term may need to pay additional fees. CCU operates the only evangelical university in the Rocky Mountain region. The school boasts an enrollment of more than 8,000 students who attend classes at a main campus in Lakewood and six additional learning centers throughout the region. CCU students can choose from over 100 undergraduate and graduate programs, many of which are offered online and with accelerated learning options. CCU's online BA in biblical studies consists of 120 credits in coursework designed to strengthen a student's understanding of the Bible, their role within the ministry or social service, and their own spiritual growth. The degree can also prepare graduates for seminary programs. Students may choose to enroll in CCU's dual-degree option, which awards both a BA and MA in biblical studies through an accelerated program. CCU students must complete a combination of major, general education, and elective courses to earn this online ministry degree. Participants also complete a biblical studies capstone course. Applicants may transfer in up to 90 credits from another accredited institution. Classes begin every 5-7 weeks. Learners complete asynchronous classes online through the Blackboard learning management system. Distance coursework at CCU emphasizes strong communication skills and a high level of student engagement through active discussion boards and a mobile app. CCU charges a flat rate per credit for online coursework, regardless of a student's state of residence. Military and veteran students may receive additional tuition discounts. Ministry offers a broad field of opportunities, so many online ministry degree options provide concentrations to help students hone their interests. Candidates should speak with departments of individual schools to get a clearer sense of whether the program caters to their needs, but we have included a list of common focuses below. Concentrations in leadership give students both the pastoral and administrative skills needed to manage and guide Christian organizations. Students explore topics such as ethical leadership, finances, planning, and furthering the gospel. Designed for those who see themselves behind the pulpit, this concentration teaches skills related to writing and delivering a sermon, scriptural context, and public speaking, as well as managing the spiritual and everyday needs of a congregation. This concentration appeals to individuals looking to minister to children and families. Students learn about the specific and unique needs of each of these communities and grow skills related to developing ministry materials for them. When pursuing an online theology degree, many students hold specific ideas about the type of required coursework needed to prepare for a role after graduating. The courses in this section offer a glimpse of common study areas, but those who know they want to take specific coursework should contact individual schools to get a full and up-to-date list. Religions and Cultures: Students in this course gain insight into major world religions, how the tenets play out in culture, and how Christian church leaders can find opportunities for growth in adopting a multi-faith perspective. This course helps those who want to focus on international ministry or missions. Pastoral Care and Counseling: A must-take class for those who want to serve as preachers, this class reviews the most common approaches to pastoral care, focuses on ways pastors can best serve their congregations, and helps develop approaches to providing care and making referrals. The Church in the Community: Developed for those students who see the church as stepping outside the chapel to serve those around them, this class observes how churches and its members can partner with their neighbors to forge bonds, work together, and create positive change for all. Cultural Considerations in Mission Work: A perfect class for those who want to spread the gospel internationally, this course employs a historical lens to explore the historical structure of missionary work and offers constructive, critical advice on how to respectfully and appropriately enter a different culture. Church Planting: This course helps students to develop the skills and discernment necessary to decide where, when, and how to open their own ministries. Students also consider church models with various campuses and think about how a new church can best respect and join the community it enters. How Long Does It Take to Get an Online Bachelor's in Ministry? As with many other bachelor's programs, completing an online ministry degree at this level most commonly requires four years and approximately 120 credits. Students who completed general education credits at a community college or previous institution may finish earlier, as may those who enroll in an accelerated program. Conversely, individuals studying on a part-time basis often spend six years working towards the degree. When researching prospective programs, learners may encounter individually paced and cohort learning models. The former refers to the standard way of learning, while cohort students progress through each class at the same pace with a group of people. When researching prospective online ministry degree options, students should pay close attention to accreditation, as this could affect their ability to transfer credits to a different school, compete for jobs, and receive licensure. The most common type of accreditation looks at institutions as a whole and falls into the categories of regional or national. National accreditation typically exists for trade and vocational programs, while many view regional accreditation as a more rigorous process for many four-year institutions. The U.S. Department of Education (ED) recognizes several Christian accrediting agencies. Examples include the Association for Biblical Higher Education, the Association of Theological Schools in the United States and Canada, and the Transnational Association of Christian Colleges and Schools. When exploring the accreditation process, degree seekers can find much information through the ED and the Council for the Accreditation of Educator Preparation (CHEA). While neither organization directly accredits colleges or universities, both uphold and monitor standards of the agencies tasked with this important job. CHEA also maintains a membership of 3,000 accredited institutions and 60 accrediting bodies. Learners seeking accredited online ministry degree options can search the ED's Database of Accredited Postsecondary Institutions and Programs. Graduates of online theology degrees can pursue a wide range of jobs. Candidates will qualify for certain career paths upon completion of a bachelor's program, while others require advanced education. In addition to considering factors such as location, area of focus, and degree level influence salary potential, degree seekers should also understand the effects of experience on income. The following table takes a look at some of the more common roles for ministry degree graduates and highlights how wages for these careers progress over time. The ministry includes a wide variety of churches, religious organizations, and Christian nonprofits where graduates may find jobs. Some feel called to the pulpit, while others may see their life's work as ministering to youth. Regardless of the path taken, these individuals have a heart for sharing their faith and possess the practical skills necessary to manage and perform administrative tasks when needed. Clergy: These faith leaders work within churches and other houses of worship to lead congregations and provide pastoral care. Some may work as lead or associate clerics, while others serve as music directors, Sunday school teachers, counselors, or youth pastors. Philosophy and Religious Teachers: Working in public and private institutions as well as Bible colleges and seminaries, these academic professionals help instill knowledge about the role of those who enter the ministry field and teach them how to view the Bible through various historical and cultural lenses. Most need to possess a doctorate. Religious Activities and Education Directors: Working in a variety of settings, these individuals help develop and direct educational and recreational programs focused on creating a faith-filled environment. They may oversee Christian schools or daycares, run after-school programs, or provide family counseling. Religious Workers: This category of employment encapsulates all other individuals working in religious employment. Examples of roles may include church custodians, office managers and administrative assistants, finance directors, service technicians, organists, ministry assistants, and deacons/ushers. Making connections and learning as much as you can about the ministry remains crucial to your professional success. Professional organizations offer a great entry point for students who want to learn more about their chosen career path. You will find three of the country's most prominent organizations for ministerial professionals below. These organizations host networking events, provide online training, maintain active job boards, and offer other services for career-ready college graduates. American Association of Christian Counselors: Currently representing more than 50,000 members, the AACC's nine specific networks include addiction and recovery, grief, crisis and disaster, and military counseling. The association offers a range of online professional development courses, along with an online bookstore. Christian Educators International Association: Originally founded in 1953, this global organization became the modern CEIA in 1984. Registered members receive liability insurance coverage, a complimentary magazine subscription, online mentoring, and discounts on various services and events. Christian Business Network: The CBN connects entrepreneurs and managers involved with religious business administration. According to the mission statement, the network strives to "provide God's people with valuable resources, networking opportunities, and world-class services to help them fulfill their calling and maximize their impact in the marketplace.". Despite the relative affordability of online ministry programs, most students still need financial assistance. Students should complete a Free Application for Federal Student Aid (FAFSA) form to learn more about loans, grants, and other opportunities offered through the U.S. government. Additionally, nonprofit organizations, companies, and other sources offer private grants and scholarships to students. Check out our collection of resources below to learn more about financial aid options. Completing the FAFSA remains a crucial first step for any student with financial needs. Our FAFSA guide features a step-by-step rundown on the process and answers to several frequently asked questions. Financial aid for online learning is equivalent to what you will find for campus-based learning, but that has not always been the case. Learn about changes in aid, as well as the different funding opportunities available to online students. Online college programs offer a flexible, affordable option for single parents interested in earning a degree and securing their family's financial future. We have compiled a list of scholarships, grants, and other financial aid options geared toward single moms and dads.